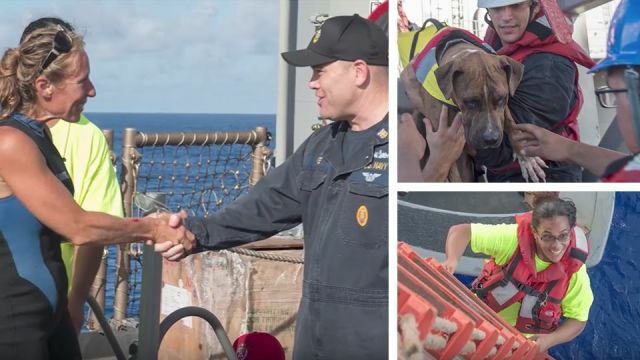 After five months at sea, two women and their dogs had basically lost all hope of being rescued, until Wednesday. Jennifer Appel and Tasha Fuiava, from Honolulu, were drifting 900 miles to the southeast of Japan, when the U.S. Navy rescued them.“When I saw the gray boat on the edge of the horizon, my heart leapt because I knew we were about to be saved. Because I honestly believed we were going to die within the next 24 hours,” Appel told NBC News. According to the US Navy, the two women, while sailing from Hawaii to Tahiti, ran into bad weather in May, which wrecked an engine. They decided to keep going, believing that wind would be enough to get them to land. Two months into their trip, Appel and Fuiava started emitting distress calls, but were too far from other vessels or land for those calls to be received. Finally, on Tuesday, a Taiwanese fishing vessel found them, which then contacted authorities. The USS Ashland headed off to the women’s boat, and arrived there on October 25, at 10:30 a.m., bringing the women and their dogs aboard their ship at 1:18 p.m.
Appel and Fuiava survived during the five months by using water purifiers and a year’s worth of dried food such as oatmeal, pasta and rice. Appel spoke with her mother, Joyce Appel, a Houston woman, by phone yesterday. Her mother told The Associated Press that she never gave up on her daughter being found, but that her daughter had run into trouble as soon as she left Hawaii — with her cellphone lost overboard a day after setting sail. “I had hope all along, she is very resourceful and she’s curious and as things break she tries to repair them, she doesn’t sit and wait for the repairman to get there, so I knew the same thing would be true of the boat,” Joyce Appel told AP. “There is a true humility to wondering if today is your last day. If tonight is your last night. If the storm that’s approaching is going to bring down the rig,” Jennifer Appel said in a phone interview with the press. While the women’s dogs are safe, just a few months ago there was another dramatic rescue of an animal — this time an elephant. In July, the Sri Lankan navy released footage of the moment it rescued an elephant that had been dragged out to sea by a current. The rescue took 12 hours and several boats and Navy divers. Hey Buddy!, I found this information for you: "These 2 Women Were Lost At Sea For 5 Months Before Being Rescued". Here is the website link: https://www.thealternativedaily.com/women-dogs-lost-at-sea-for-5-months-almost-lost-hope/. Thank you.